We’d love your help. 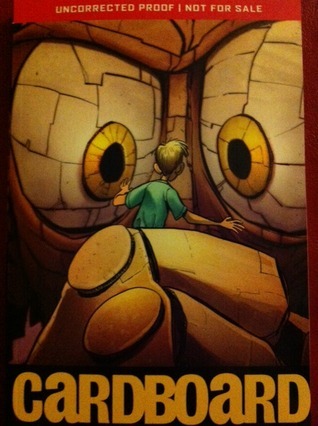 Let us know what’s wrong with this preview of Cardboard by Doug TenNapel. To ask other readers questions about Cardboard, please sign up. Every page in Doug TenNapel’s Cardboard pops to life with color, action, imagination, and heart! Strong father and son messages color and fill these pages. Fathers trying to find a way to communicate and bond with their sons. (view spoiler)[ I really didn’t want to mention this, but the women characters need work here. Very flat. Tina!--the man will move on when he is ready! Sorry just needed to get that out. The next door neighbor drove me nuts! (hide spoiler)] I loved Cam and his father’s banter and relationship, but about half way through, the story seemed to shift more towards understanding Marcus—the neighborhood bully. To be honest, I really didn’t like Marcus. His eyes gave me the creeps. Huge pools of creepiness! I realize that isn’t the greatest reason to dislike a character, but it’s the truth. Haha…Plus I may have overdosed on the sad, misunderstood bully characters and tales lately. I wished the focus and spotlight had remained on Cam and his Dad. This comic book is built around a brilliant idea! Cardboard people and monsters that come to life! Love it! But it had a few bumps for me. We never truly learn why or how the cardboard comes to life or any concrete reasoning behind the rules of the box. I’m all for mystery and magic--sometimes not knowing fills a story with wonder and power. But here it just felt a bit lazy leaving so many unanswered questions. A fun adventure packed with action that will find an audience. But for me, this tale lost its bite and magic about half way through. It's hard to review this book. The adventure part of the story was fine, and it was kind of interesting to read a comic with so many super-conservative messages in it. It was your typical set-up of a Really Good Guy just trying to Provide For His Family. The first thing you learn about the RGG is that he's too--I don't know--Republican or something to accept much-needed welfare to feed his son during the Hard Times (mancession?). Of course, there's some Marilyn Manson-loving freak who, in a comp It's hard to review this book. The adventure part of the story was fine, and it was kind of interesting to read a comic with so many super-conservative messages in it. It was your typical set-up of a Really Good Guy just trying to Provide For His Family. The first thing you learn about the RGG is that he's too--I don't know--Republican or something to accept much-needed welfare to feed his son during the Hard Times (mancession?). Of course, there's some Marilyn Manson-loving freak who, in a completely realistic reflection of teenage social dynamics, is bullying RGG's Totally Normal Son. This is because the freak's Overly Liberal Daddy doesn't take time to man-bond with his son and teach him traditional values--like, that only girls wear their hair long and such. I think I was emitting a quiet, elongated moan of disdain during the entire story, even though it was on the surface a fun enough adventure story. There was just so much ick behind it all for me, personally, but it's cool to know that there's a comic for everyone! Now I know what to recommend to neocon parents who come to the library looking for handouts books for their kids sons. In my own personal collection, this book would get 1 star, but I feel oddly compelled to give it 2 stars here just for being a well produced piece of conservative American culture in a genre that is--ah, let's be honest--a slightly different mix of conservative American culture most of the time anyway. 5 stars! It was great. I loved pretty much everything about it. Cardboard is about a down in luck dad named Mike. His wife has passed away and he is trying to raise is son Cam all alone. He is also between jobs and no one is hiring. A sad start to any story. It's his sons birthday and he wants to buy him something great but he can't afford anything. Mike sees a stand on the side of the road selling cheap toys. The man, Mr. Gideon, learns that Mike's son Cam is a really good boy and so he sells Mi 5 stars! It was great. I loved pretty much everything about it. Cardboard is about a down in luck dad named Mike. His wife has passed away and he is trying to raise is son Cam all alone. He is also between jobs and no one is hiring. A sad start to any story. It's his sons birthday and he wants to buy him something great but he can't afford anything. Mike sees a stand on the side of the road selling cheap toys. The man, Mr. Gideon, learns that Mike's son Cam is a really good boy and so he sells Mike a cardboard box for 78 cents. This box, Mr. Gideon says, can be made into anything as long as you use your imagination. It turns out Cam is a really good kid and when Mike comes home with the box Cam is excited. They build a boxer out of the box and the box boxer comes to life! They name the boxer Bill and the story goes from there. This was so.....different!! Really fun and silly. :D I enjoyed! I'd say Doug TenNapel is a sure bet: everything I've read by him (admittedly only a sliver of everything he's done) is smart, brisk, accessible, and graced with enticing high concepts and obvious emotional hooks. He cartoons with brio, he's prolific and seemingly always on full boil (what, about a graphic novel a year? ), and so I have to believe he loves his work. Cardboard, a broad, eager, winning fantasy, is his latest, and takes off like a rocket from a simple, tantalizing premise: a widower I'd say Doug TenNapel is a sure bet: everything I've read by him (admittedly only a sliver of everything he's done) is smart, brisk, accessible, and graced with enticing high concepts and obvious emotional hooks. He cartoons with brio, he's prolific and seemingly always on full boil (what, about a graphic novel a year? ), and so I have to believe he loves his work. Cardboard, a broad, eager, winning fantasy, is his latest, and takes off like a rocket from a simple, tantalizing premise: a widower and his young son stumble on some magical cardboard that can be used to bring to life creatures of their own making; chaos results! I had fun reading it. As I read Cardboard, I thought, "This could be a Pixar movie. Or Laika." That's what it reads like, and almost everything filmmakers would need script-wise is already here: every major character has a problem or want and gets to exhibit change (i.e. everybody's got an arc); the initial premise spirals out of control into a series of set pieces that look good on paper and could look great on screen; the plot forks into alternating character bits that could be cross-cut in a movie for maximum suspense's sake; and there's a tender father/son pairing at the heart of it. Plus the grieving widower whose inability to move on in life calls to mind Finding Nemo. Characters that seem broadly drawn at first, such as a truly dislikable neighborhood punk, get peeled back, softened up, and rounded, yet TenNapel doesn't get so sentimental that he forgets to keep on delivering little narrative shocks right up to the end (his inventiveness is in high gear). And reading the book is a breeze: varied layouts and elastic pacing carry the story effortlessly, and, man, TenNapel really cracks the whip. So, a charming gust of a book, whirlwind-quick, and eager to please: an impressive workout with craft to spare. Yet I find myself wishing that TenNapel's character arcs and themes weren't so obvious. There's something programmed about them, like the over-familiar dramatic riffs in so many movies. You know, stuff that sounds as if it were dreamed up around a conference table: this character will undergo a big Change and resolve his Issues, et cetera. It all reeks of Screenwriting 101. On the other hand, it does work. I mean, TenNapel does follow through; he doesn't forget his characters or shortchange them; he seeks to deliver a Well-Wrought Tale where nothing is wasted. And he does. I personally enjoyed the concept a lot in this book. It is a very good concept like how you can make things with cardboard that are alive. But the characters were awful. There was character development at all. Also it would take random skips in time. Then there was also the weakness for cardboard. Which is literally everywhere so it could have been a really quick ending but it was not. I would not recommend it to an older audience. The reason it is so high in the star rating is because I really I personally enjoyed the concept a lot in this book. It is a very good concept like how you can make things with cardboard that are alive. But the characters were awful. There was character development at all. Also it would take random skips in time. Then there was also the weakness for cardboard. Which is literally everywhere so it could have been a really quick ending but it was not. Mike is an out-of-work carpenter and a widower with a young teen son, Cam. When Mike can’t afford a birthday present for Cam, he encounters a strange toy salesman who offers him a cardboard box for under a dollar. The man gives Mike some rules: he has to return any unused cardboard and he can’t have more. Mike and Cam make a boxer out of the cardboard, and the boxer comes to life. “Bill” and Cam are fast friends, but when Cam’s wealthy and mean-spirited neighbor Marcus decides he wants magic card Mike is an out-of-work carpenter and a widower with a young teen son, Cam. When Mike can’t afford a birthday present for Cam, he encounters a strange toy salesman who offers him a cardboard box for under a dollar. The man gives Mike some rules: he has to return any unused cardboard and he can’t have more. Mike and Cam make a boxer out of the cardboard, and the boxer comes to life. “Bill” and Cam are fast friends, but when Cam’s wealthy and mean-spirited neighbor Marcus decides he wants magic cardboard, too, things quickly get out of control. Cardboard is visually appealing with Tennapel’s unique style and bright colors. Aimed at the middle grades, there are strong themes of right/wrong and decision making, but they were obvious and direct. While it’s good for a younger audience, it could annoy older readers. I liked Mike—he’s a strong father figure, which is rare in stories for younger people. He’s not perfect, and he has his own issues to deal with, but he puts his son first. The story switches focus halfway through—it’s no longer about Cam and his dad, but about Marcus and why he’s such a bully. It was here that the obvious moralizing got to be too much for me. I also felt that the characters were stereotypical—evil Marcus is a long-haired Marilyn Manson lookalike, honest Mike is a muscular, good-looking guy, etc. The overall story actually reminded me of the “Goofus and Gallant” cartoons in Boy’s Life. •	Marcus has a pet rat that he is constantly putting in harm’s way. I felt like I was supposed to be mildly amused by these scenes. The rat, Fang, always comes out unscathed, and Marcus’s obliviousness to the well-being of his pet characterizes him as a callous jerk. However, this problematic behavior doesn’t change. •	There’s some gross-factor to this book. Marcus has a friend named Pink Eye whose eyes are red and infected. •	The violence in the story involves cardboard people and monsters. Although they’re made out of cardboard, the reader will empathize with cardboard Bill—if he’s sentient, then aren’t the others? So while the war is against “cardboard,” it’s hard to separate the “what’s alive?” element. •	There are fist fights and weapons. The weapons are made out of the magic cardboard and only injure cardboard creatures. The book is great because I really liked how is written and the conflict that was made by the author.I really like how the dad got him a box and the son was fine with it and they made it into a boxer,after they slept the card board became alive and it was mesmerizing that he became alive i would recommend this to 8 graders and below because is a picture book and I don't think every one likes it. Imaginative idea about a widower and his son and how their lives are changed with magical cardboard that comes to life. The pages are filled with grief, moving on, action, adventure and bold colors. The story is unique and truly creative. Perfect gift for my 11 year old son. He read it in a day! Then my 5 year old son wanted me to read it to him -- and right after we finished it, he asked me to read it to him again. This book addresses so many issues, and naturally. Nothing seemed pushed or hurried. A very fun read that manages to introduce some basic philosophical questions. I took a gamble and bought this book online, solely based on its good reviews. I'm so glad I did! I'd highly recommend it. This could be the book that gets Perfect gift for my 11 year old son. He read it in a day! Then my 5 year old son wanted me to read it to him -- and right after we finished it, he asked me to read it to him again. I took a gamble and bought this book online, solely based on its good reviews. I'm so glad I did! I'd highly recommend it. This could be the book that gets kids into reading. This book is about a carpenter and father, raising his young boy by himself, and struggling to provide for the both of them. He's looking for a birthday gift for his son and finds a man selling toys on the side of the road. He doesn't have much money, and buys a cardboard box, what the seller says is a great father-and-son project... but, there are two rules that come with buying this box. He has to give the scraps back and he can't ask for more. So with the box, he and his son crafts a boxer, wh This book is about a carpenter and father, raising his young boy by himself, and struggling to provide for the both of them. He's looking for a birthday gift for his son and finds a man selling toys on the side of the road. He doesn't have much money, and buys a cardboard box, what the seller says is a great father-and-son project... but, there are two rules that come with buying this box. He has to give the scraps back and he can't ask for more. So with the box, he and his son crafts a boxer, who the son names Bill. His son, Cam, is an imaginative boy who enjoys creating things. But then Bill comes to life, making their neighbor's rich and spoiled son, Marcus, jealous. Marcus steals some cardboard and creates some monsters who make more monsters and transform the house (and attempt to transform the earth) into a giant Cardboard world, conquering it and making it theirs. The artwork and writing is both amazing. The characters are great and transform a lot over the course of the story. I found Cam relatable and the whole story amazing. This is definitely a book you should read. Doug always has great characters, interesting and deep themes to discover, complex problems to solve, and evil to be defeated and redeemed... All with incredible artwork. Another great graphic novel! I liked it, it wasn't the best book I've read, but it was good. I have definitely read better Graphic Novels. Another great story from Doug TenNapel! Nothing too fancy, just good storytelling. One his strengths is his ability to keep the story from slowing down. The characters interplay with each other very well, and the story has a type of efficiency in the pacing that makes it easy to read. The art is vibrant and colorful, which adds to it nicely. There are a couple touching moments, but mostly the book is what I think the author intended for it to be- light, fun, easy, and enjoyable. Doug is one of my favorite authors, and this book is one of the reasons why. It gives me a sense of imagination I have never had before. I find Doug TenNapel a maddeningly inconsistent storyteller. He goes from the wonderful Ghostopolis to the disappointing Bad Island while delivering inventive graphics aided with strong color. Now we have Cardboard, which starts off with such promise and right around the halfway mark things spiral entirely out of control and become way too over the top. Mike is an independent carpenter who recently lost his wife and the sour economy means he’s inching towards bankruptcy. We open on his son Cam’s birthday as Mike, with a mere seventy-eight cents to his name, desperately seeks work to afford a present. Despondently he heads home until he encounters Gideon, a roadside huckster who sells him a cardboard box for exactly seventy-eight cents. When Mike complains it’s empty, Gideon screams, “Empty? It’s full! Full of ideas…projects…adventure!” But of course, it comes with rules which will later drive the story. The box is at first skeptically received until the two take tools to it and suddenly it is transformed into a boxer that magically comes to life. Bill the boxer comes complete with a rudimentary vocabulary and intelligence making his a step above an adorable puppy. He follows orders and is out mowing the grass before you know it, earning Cam the enmity of his spoiled goth-inspired friend Marcus, accompanied by his sidekick Pink Eye. A squirt of water soaks the cardboard man and brings him near death until Mike uses the scraps to build a device that emits fresh cardboard, which is then shaped to replacement parts and Bill lives. But Marcus wants the device and his own cardboard man and from there we begin the slippery slope down to lunacy. Marcus of course gets the device and uses it without understanding the rules and just like the Sorcerer’s Apprentice, one becomes many and all set to work. Given their intelligence, they decide to rule the world and the neighborhood is taken over by the growing numbers of cardboard simulacrums of people. Of course, a garden hose would have nipped this in the bud at the outset but Mike and Cam appear to have lost their logical thought processes by this point. And this sort of lack in internal logic, which doomed the previous outing, also comes to haunt this work which showed such lovely potential at the outset. Mike is despondent over his dead wife, feeling like a failure in raising Cam and is totally oblivious to the mutual attraction he has with his next door neighbor, the single Tina. We’re told how broke he is early on – not enough money to buy food let alone a present, but that thread is instantly dropped until the happy ending. The growing intelligence and development of Bill the Boxer as a character started off well but got shoved to side for the kinetic action that overwhelms the narrative. Mike, Cam and Bill are the most rounded characters while Marcus, hid Dad, and Tina are as two-dimensional as the cardboard that starts this off. Just how did the cardboard become infused with magic? Gideon gives an incomplete answer first saying it is a result of alien or alien magicians that also can understand quantum particle physics. We never quite know or how Gideon obtained this wondrous object. In the grand scheme of things, its largely inconsequential to the overblown action. TenNapel’s artwork is quite good and he tells his stories well, aided with superb color from Der-Shing Helmer. He acknowledges the editorial contributions that he felt made the book work but frankly, it needed serious editorial guidance to retain the emotional core which was sacrificed for too much cardboard plotting. Some people from our community think that not getting an item of clothing is hard, but for other people getting a meal is difficult at best. That is the life of the two main characters in the book Cardboard. The father, Mike, is working his hardest to find a job while his town is going through a poor time. On the same day, it is his son's birthday. When Mike can't find a present for his son, Cam, he goes to a stand that was advertising free toys. The man there sells him cardboard but Mike soon f Some people from our community think that not getting an item of clothing is hard, but for other people getting a meal is difficult at best. That is the life of the two main characters in the book Cardboard. The father, Mike, is working his hardest to find a job while his town is going through a poor time. On the same day, it is his son's birthday. When Mike can't find a present for his son, Cam, he goes to a stand that was advertising free toys. The man there sells him cardboard but Mike soon finds thinks that anything this man says is crazy. Mike disregards everything he was told and builds a boxer out of the cardboard with Cam. When they wake up, the cardboard is alive and tries to find out what was going on. Cam takes out the cardboard and tries to teach it how to be a person. As the duo goes on, they find the neighborhood bully with a water gun. The cardboard man gets sprayed and the family tries to find a way to fix it. Though the crazy man said not to make more, they do this and fix the cardboard man. The neighborhood bully, Marcus, begins to envy Cam and tries to steal the cardboard maker. Cam and Marcus had a conflict with each other due to the sides they were on. Cam was more of a kind person while Marcus tried to make everything revolve around him. Marcus makes off with it and begins to make his own army of cardboard creatures. These creatures soon gain a self-awareness and overrule Marcus. Cam and his family find a way to deffest these creatures, but not without losing their cardboard man. A main theme of the story is that even the most heroic of people give things up despite the fact that they're trying to help. Nonetheless, they find in the end that everything would work out. The title of this book could never fully capture the beauty of this book. I believe this because there are so many themes and meanings to the book that it would be impossible to describe the book in one word. For example, even though Cam and his father are poor, Cam still makes the best out of everything and help out his father. Another example could be how Mike had to get over the death of his wife so he could let someone else into his life. Both of these themes could teach anyone a lesson who is going through a hard time or trying to get over someone they love. The villain in the story, Marcus, had a conflict with himself too. He never really liked how he was but when Cam and Marcus got close he got better at accepting himself. This could show some readers that everyone could use a friend to talk to or even just say hi to, or that it doesn't take much to help someone feel better. The author of Cardboard described many different relationships. This is important in a book but so is describing the classes the author properly instead of focusing on romantic relationships or friendships. The reader is most likely looking for an accurate description of the classes if they are often used. Also, cramming so many themes may be more confusing to a younger reader. Overall, there's plenty of imagination but depicting it may be a tad tiresome for some readers. This book is a 3, as it had many interesting themes, though they were buried a little too deep in the plot. I would recommend this book to readers that try to dissect every book and find ways to compare them to very interesting things. I would also recommend this book to people that know how hard things can be in the world. This book is filled with imagination, many opportunities for comparisons, will leave you thinking about how you handle your situations, and what is important to you. I fully agree with the statement that this story conveys bizarre fun in the sense that it makes the "toy" of a cardboard box come to life and seem exciting by giving it a true life of it's own. It comes with unexpected turns, such as small cardboard characters who tell jokes. I was surprised to read that it fails to deliver on a few plot points, but when I thought back, I could immediately come up with 2 points that were not finished in delivery including a failure to follow through on the rules or assign consequences for the use of the cardboard and the disappearance of a few minor characters without comment. Here's a graphic novel you'll want to recommend to your middle grade/young adult readers as part of a 40 Book Reading Invitation. Inventive look at life, death, loss, and grieving. This graphic novel reads like Gremlins meets UPS. And I love it. When an out of work widow goes to find his son a birthday present with his last seventy-eight cents, a mysterious man has just the gift--a cardboard box. But this box comes with certain rules. And these rules need to be followed lest the world fall into co Here's a graphic novel you'll want to recommend to your middle grade/young adult readers as part of a 40 Book Reading Invitation. When an out of work widow goes to find his son a birthday present with his last seventy-eight cents, a mysterious man has just the gift--a cardboard box. But this box comes with certain rules. And these rules need to be followed lest the world fall into corrugated chaos. Definite "ladders" to Alan Silberberg's MILO: STICKY NOTES AND BRAIN FREEZES which further demonstrates how these graphic novel/illustrated texts hybrids are addressing deeper subjects and themes for younger readers. Pair up these texts and let the discussions begin! I enjoyed Cardboard for two reasons. It was face-paced (as any graphic novel, I suppose) and creative. I usually do not like graphic novels, but this one was okay. It was extremely creative and was fun to read. It encourages imagination and has a good "moral to the story." The protagonist, Cam, is a young boy who receives from his father the worst birthday present. Together father and son create something out of nothing and go on an extraordinary adventure. There are also some underlying themes such as, the dad and the neighbour girl, and Marcus' internal conflicts and family issues. I don't typically read graphic-novels. My fourth graders love them, but it's not my favorite style. I recently got a set of TenNapel's books from Scholastic and randomly picked this one up last night. I was in the mood for something quick. The story was creative. A dad is out of work and has no money for his son's birthday. He brings him home a cardboard box and discovers that anything made with the cardboard can come to life. A bad kid in the neighborhood gets a hold of the cardboard and create I don't typically read graphic-novels. My fourth graders love them, but it's not my favorite style. A bad kid in the neighborhood gets a hold of the cardboard and creates a monster army. This review has been hidden because it contains spoilers. To view it, click here. This is one of my favorite graphic novels I have ever read. It's about a cardboard boxer that helps the young kid in the family learn boxing moves. The young kid's mom died but his dad was still alive and living. One of the kid's friend took the cardboard maker that makes the cardboard come alive and he made villain's out of it and they destroyed the bully's house and the neighborhood around them.